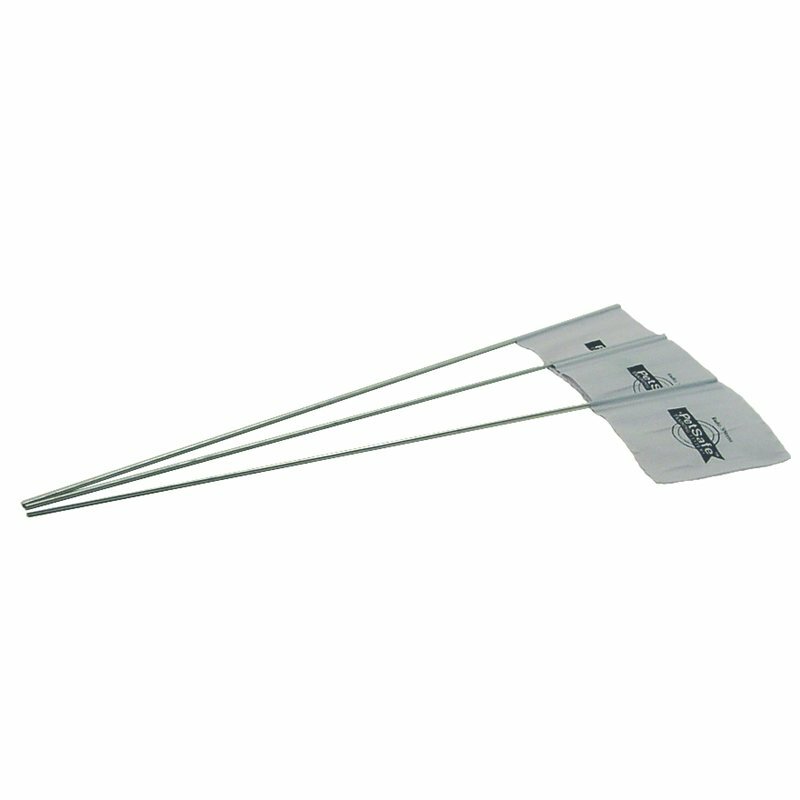 The Petsafe Instant Fence provides the safest, simplest form of pet containment ever. 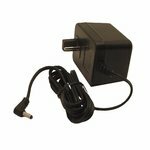 You plug in a transmitter somewhere inconspicuously in your home, and it emits a radio signal around your house. 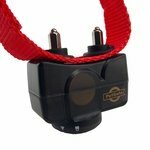 Your pet wears a lightweight receiver collar which listens for the signal. While it's receiving the signal, your dog is free to run and play. 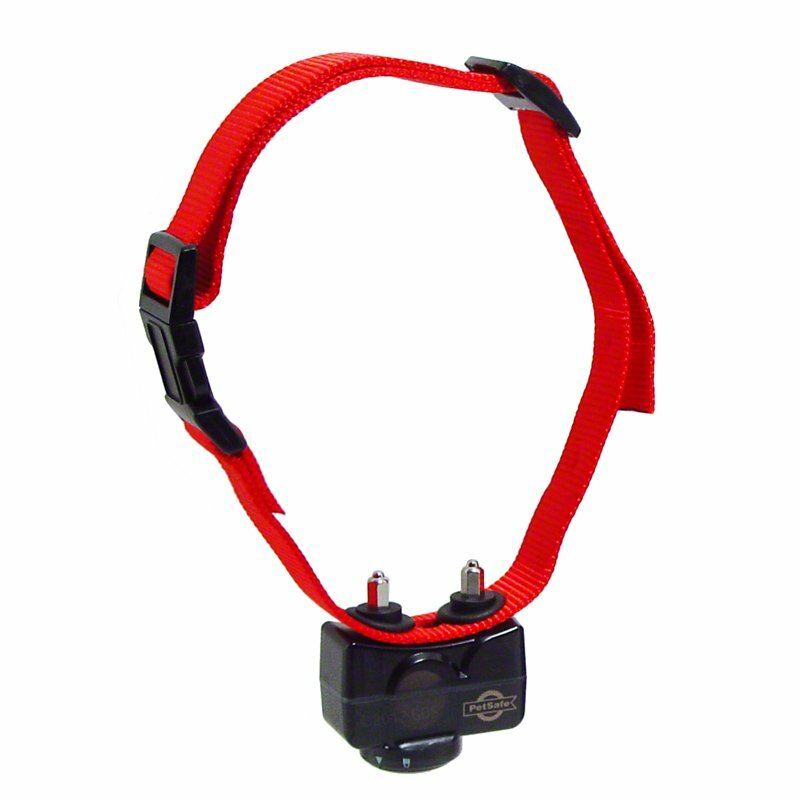 When the collar approaches the boundary of the signal area, it gives your dog a warning beep. If your dog continues, he receives a light static energy pulse which is startling but not harmful. With a little training that is simple and quick, your pet quickly learns his boundaries. Setting the boundaries of your yard takes only a few minutes by adjusting the range on the transmitter, from a radius of just a few feet to up to 90 feet. 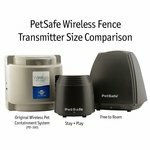 Petsafe Instant Wireless Fence (PIF-300) FREE SHIPPING / 100% Satisfaction guaranteed! 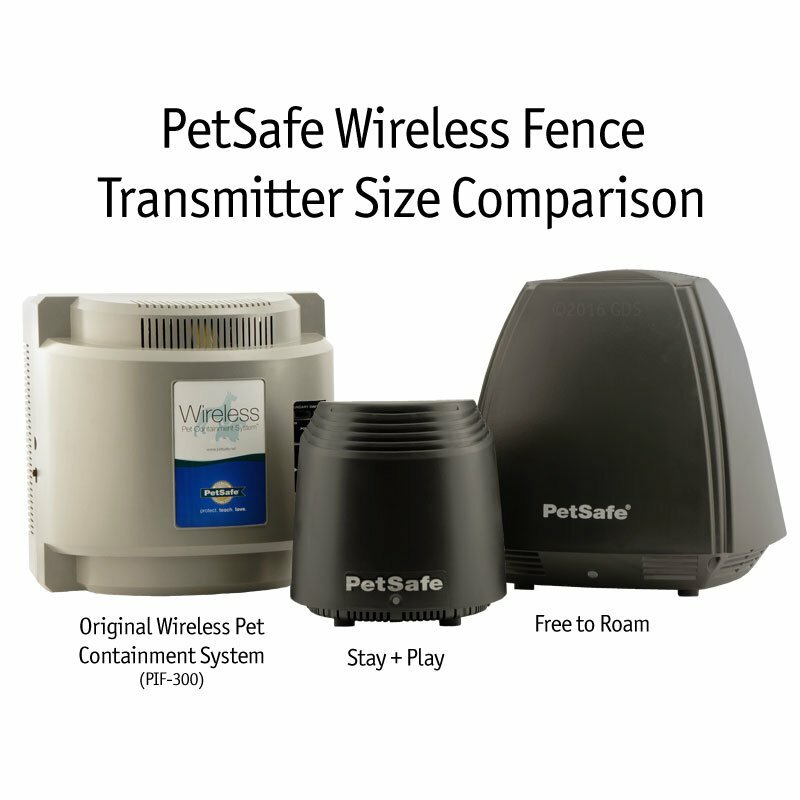 Today we're looking at the PetSafe PIF-300 wireless fence. This is one of the few wireless fences on the market today. It is radio signal based. What that means is unlike a wired fence, you don't actually have to bury anything in your yard. 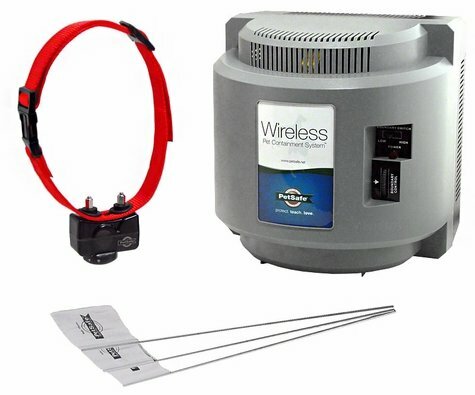 You have this system right here which you put inside your house, and it sends out a radio signal that allows the dog to go up to 90 feet away from the transmitter. So you've got a circular area that is your containment area for the dog. These are great systems for folks that don't want to have the hassle of having to bury wire. For the folks that understand what this system does and what its limitations are, it's real popular. The thing you've got to understand is that it's not going to fit your yard exactly. It has a set radius. And either it works for your yard or it doesn't. So you've got to understand the concept behind it. I used these several years ago in a house that we lived at that had a backyard but it didn't have a fence in the front yard. I wanted my dogs to have access to the front yard. So what we did was we set up a wireless fence. This allowed them to run out in the front yard but not get in the road. It worked great because of the size of my front yard. So the biggest thing you've got to look at is the shape of your yard, how close you are to the road, and whether or not it's going to fit what you are trying to do. Figure out where you can plug this up. It's got to be protected from the weather. So we're going to set this unit inside the house or the garage, and then we're going to go away 90 feet from that and see where that puts us. So you've got to experiment with it a little bit, test it. What's nice about it is it's an easy system to set up. You can have it up and running in just a few minutes. And you can figure out if it fits you really well. And if it doesn't, then you may want to look at a wired system. We've had these on the market for years. 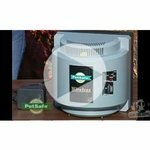 It's a great little system for folks that are looking for something that's portable and that is easy to set up. The other nice thing about them is that the collars have individual stimulation settings. So if you have one dog that's tougher than others, you can increase stim on that dog but it won't affect the other dogs. So that's a nice little feature. Very popular unit for us. It works great for folks that are looking for a real easy way to contain their dogs. 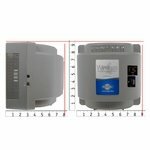 "We bought this product over 2 years ago, and it works like a charm. Even our rescue dog was trained within a few days." 1 CORGI & 1 MIXED. Family pet. This product is EXCELLENT!! We had an electric fence company give us an estimate and they wanted $2,600 to wire our yard + said we would require extra training lessons for our rescued severely abused dog. 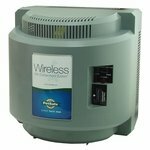 We bought this product for $279.99 over 2 years ago and it works like a charm. Even our rescue dog was trained within a few days. "Have used it for over four years now with no problem at all." Spaniel Terrier Mix. Family pet. Though we live in a very rural area, I have to keep my dog away from the neighbors. They all have cats, and he very much sees cats as prey! Petsafe has worked great. Have used it for over four years now with no problem at all. Very effective. "We live on a busy corner, and it keeps him in the yard. It even works when other dogs walk by or squirrels, rabbits are in site." I love it! Easy to set up and my dog responds very well to it. We live on a busy corner and it keeps him in the yard. It even works when other dogs walk by or squirrels, rabbits are in site, even with his strong hunting instinct. Please be willing to take the time to train your dog just as the instructions say, it does take some dedication on the part of the dog owner in the beginning but WELL worth it! "Within 2 weeks we no longer had to worry about her taking off or roaming the streets. " We have used this fencing system for well over a year now and it has been great! Our pup was 6-8 months old when we purchased this fence, the training instructions included were easy to follow and understand. Within 2 weeks we no longer had to worry about her taking off or roaming the streets. Fast forward a year...even if she goes outside without her collar on she will not leave the boundary area! One of the things I really love about this unit is the portability. We love to go camping in the summer but hate having to keep the dog chained, but with the converter kit we can now take our fence with and it doesn't take long to establish the new boundary. My online ordering experience and the helpfulness of Gun Dog Supply staff was absolutely AWESOME! Not only were they able to answer all my questions (and hesitations) my product shipped quickly and arrived 2 days before expected! I will order from Gun Dog Supply again when the need arises, until then I look forward to reading their monthly newsletters. "We tried the instant fence, and in ONE day (no exaggeration) the dogs were trained and don't leave the yard, even without the collars on." Have two Great Danes that nothing worked to keep them in the yard. We tried the instant fence, and in ONE day (no exaggeration) the dogs were trained and don't leave the yard, even without the collars on. Dogs learn to jump through a one shock system, this one keeps "reminding" them with shocks until they're back in their zone. Whoever invented this did a great thing!! Thank you!!! "Worked great for me at several locations"
Britainy/Golden cross brother & sister same litter. Hunts. Family pet. The system has worked great for me at several locations. I did have to encapsulate the receivers in ABS plumbing elbows with holes 3/8" diameter drilled to accommodate extra long probes. The dogs being together all the time would chew each other's receiver into an unusable state. The elbows keep the receivers in a brand new condition because I wrap them with electrical tape. This does put more wear on the probes' sockets taking them out to change the batteries every 90 days. I had one to break but Pet Safe sold me a replacement at a discount. The only con is the system does not keep the dogs out of flower and shrub beds contained within the perimter. My neighbor would have purchased a system but went with the underground to keep her dog out of her plantings. "Great product. I have recommended it and have recommended Gun Dog Supply to several friends." Great product. I have recommended it and have recommended Gun Dog Supply to several friends. Norwegian Elk Hound,Boykin Spaniel. Family pet. We used this fence as a temporary at a home while we were building a new home. It worked really well for the six months we used it. "We had issues with the Elkhound at first not respecting the boundary, until we added a stubborn dog collar for him. Then he learned to respect the boundary. Now we have over 2 years of complete containment." We had issues with the Elkhound at first not respecting the boundary, until we added a stubborn dog collar for him. Then he learned to respect the boundary. Now we have over 2 years of complete containment. We did lose the transmitter once due to lightning, but the dogs were so well trained that they did not challenge the boundaries before we had it replaced. "We tried everything including other electric fences and nothing seemed to work. A friend of mine told us about the Petsafe Instant Fence and I could not be more satisfied." My husband and I were living in a neighborhood with houses very close to each other. Our backyard was a little over an acre and with two labs. They were constantly trying to get out. They did managed to escape several times. We tried everything including other electric fences and nothing seemed to work. They even began chewing and ripping holes into our wooden fence. A friend of mine told us about the Petsafe Instant Fence and I could not be more satisfied. It was very simple and easy to set up. Our dogs were very quick to learn their limits and were not able to leave the backyard since! "I love having our dogs be able to run around our property, and I don't have to worry about them running off." PetSafe instant fence works great & was easy to set up. I love having our dogs be able to run around our property, and I don't have to worry about them running off. "Even my dog is happy!" Great price. In stock. Even my dog is happy! "They WILL NOT go beyond the set boundary even with people walking by with their dogs. Worth every penny. Would buy again." We have been using this for almost 2 years. 1 beagle and 1 Mt. View Cur. Both energetic and fast. Trained them in just a couple of days. They WILL NOT go beyond the set boundary even with people walking by with their dogs. Worth every penny. Would buy again. I am not affiliated in anyway with the product. This thing works. SAVED MY DOG'S LIFE. My male husky would run off at every opportunity and take the lab with him. He has ended up in doggy jail twice and gotten hit by a car once. In a last effort to keep my husband from taking him to the pound I bought this wireless fence system. My Lab caught on the first day, but I worked with my stubborn husky for four days, showing him the perimeter and letting him hear the tone as the instructions said. On the fifth day I turned on the shock to level 3 and let him run with no leash. He immediately tested the barrier, received his correction and came right back to the porch. It actually took me another week to get him to come off the porch without a leash on, and he has not tested the perimeter since. We even take it with us camping and plug it into the RV and set up some flags. I can feel safe letting both my dogs play in the yard without worrying that they are going to run off. Thank you so much. "This has changed our lives." My husband trained our son's dog, and it works like a charm. We feel really relaxed; confident that Brie will stay within her boundaries . The bell sound is enough to scare her. This has changed our lives. We just clip the collar on Brie, let her out the door and know that she is safe . Now we really have fun playing, running, jumping and chasing without her being attached to a lead. Best $ 279.00 we ever spent. We gave it to our son to take home with him but when we dog sit for him again he will bring Brie's collar and the receiver for us to use. That is the beauty of system. It is transferable. Buy it! You will love it! I'm so glad I purchased the Petsafe instant fence. My dog no longer goes into the road, bothers the grandchildren when they are playing baseball or chases our beef cattle. Love that fence. Our dog is very nervous over some things, so we only have it set on 2, and she won't even go out as far as her limits. We need to work on that, but I am pleased with the fence performance. "Works great and gives both of us more freedom." Easy setup, and fast shipping. Works great and gives both of us more freedom. "Everything is working great, and the dog learned the boundary in about three days." Only problem was with the test light, and they sent out a new one. Everything is working great, and the dog learned the boundary in about three days. I love it!! I showed her the boundaries, and that was it. It only reaches 100 feet. That is not far enough. We need something 2 or 300 yards. An excellent concept. Easy to set up. Unfortunately, the building code in our area requires a lot of rebar and concrete, so consistency and range are issues. This product worked great! My dog instantly learned the boundaries with the use of the flags! Only had 1 correction on timid setting, and now he will run all around the yard without me having to worry! Well worth the money! "Our dog learned his boundary in about 4 days." Our dog learned his boundary in about 4 days. This product works great, and keeps him safe . Thanks again Gun Dog Supply. I have not used this fence as of yet. It was purchased so when I visit friends homes without a fence it could be used there. I will begin the training process shortly. I am sure this product is as great as all that I have purchased from you. She trained so easily on the device. Such a relief for her not to be running into the road or chasing the neighbor's cats. Don't know what took me so long to get the wireless fence. So glad I did. Love this system. So simple to install, and I never have to worry about my dog getting out again! The training was easy and very effective. 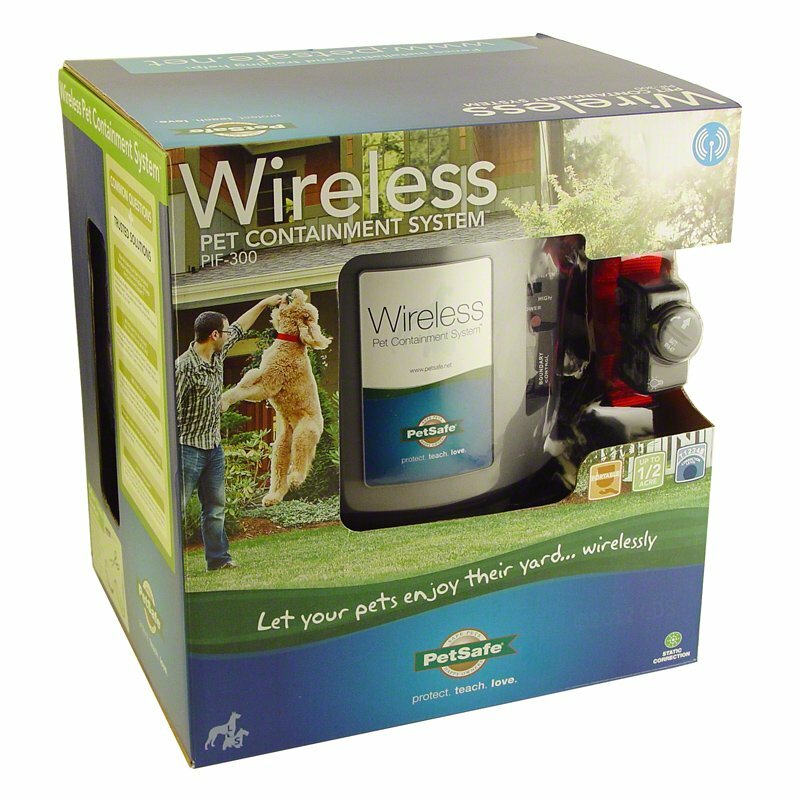 The petsafe wireless electric fence works amazing. I was worried that our cars would set the collar off, it did when we set the radius to go through the area where we park. We just expanded the fence to go out further and no longer have that problem. Now my dog can go into the neighbor's yard a little bit, but we placed the flags so that my dog would think he couldn't go in their yards. So far so good. "Dogs know where the boundary is. We don't even have to use the actual collar on the Schnauzer anymore." Works great! Dogs know where the boundary is. We don't even have to use the actual collar on the Schnauzer anymore. He knows where the boundaries are and stays in line. "Easy to set up. Price is right." Easy to set up. Price is right. "The fence works great, even when the neighbor's ducks are hanging out in my yard just out of range." The fence works great, even when the neighbor\'s ducks are hanging out in my yard just out of range. The only complaint I have is the plastic clip broke on the collar. Luckily, we noticed it right away. "Works great for the 2 Labs, the 14 yr old Beagle will still muscle through the pain determined to get the rabbits and squirrels." Lab and Beagle. Family pet. Works great for the 2 Labs, the 14 yr old Beagle will still muscle through the pain determined to get the rabbits and squirrels. "Just a little training, less than a week, and my bassets were staying where I wanted them to stay." Love this fence. Just a little training, less than a week, and my bassets were staying where I wanted them to stay. No digging! Wish the range could be a bit larger, but for the ease of the unit, it is still a five star product. "This is the best dog product I have ever owned." I am in my fifties now and have had dogs all my life, and this is the best dog product I have ever owned. I recommend this wireless fence to all my friends and family. Love it and so does my dog Zoe! I find this "instant fence" very flexible. It is used at both of my homes and the boundaries can be easily adapted for the individual footprint of each property. Great product! "It has been in use since August 2008 with no issues." I am very pleased with the Petsafe Instant Fence! It has been in use since August 2008 with no issues. 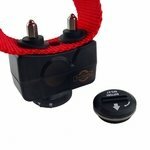 Very easy installation (plug it in and train the dog)! "As far as how it works and your dog learning their limits, you can't beat it"
"With the PetSafe wireless fence system, I can let my GSP roam loose without any worries." "Our dog has respected the fence from day 1." Our dog has respected the fence from day 1. Works outstanding. "I live on 2 acres, and I didn't want him chained up every day. This was the ideal solution." I live on 2 acres, and I didn't want him chained up every day. This was the ideal solution. I am very satisfied with this product. Would recommend it to others. It really works. "I realized I did not need it and have returned it, thank you." I realized I did not need it and have returned it, thank you. I hope it is received in good order very soon. "Like product. It works well. I am dissatisfied with the battery life." Like product. It works well. I am dissatisfied with the battery life, maybe two weeks. Also wish there was a larger radius to signal, but I do like the ability to combine sending units. However, that is expensive. "The fence works great as long as the battery to the collar is not dead. However, the batteries only work for about 3 weeks before going bad." The fence works great as long as the battery to the collar is not dead. However, the batteries only work for about 3 weeks before going bad. The company says they should last at least 3 months, but I have replaced them several times and they all only last around 3 weeks. "The dogs are so familiar with their boundaries that most of the time we can just leave the collars on without their batteries, and the dogs know where they can and cannot go." We've had our wireless pet fence now for about 5 years. We've had to replace a few collars. They are not chew proof to young dogs. The wireless fence works great. The unit allows us to create the perfect sized perimeter, so that our dogs are not in the street and not in the pastures with the horses. The dogs are so familiar with their boundaries that most of the time we can just leave the collars on without their batteries, and the dogs know where they can and cannot go. "Keeps our dog safely in the yard." The fence works extremely well. Our dog learned her boundaries quickly and knows not to get close to it. We have had to replace the batteries in her collar 3x, which I feel is a bit much. The other thing is we've had to replace the collar a few times because the sensor has worn through and fallen off. Otherwise it is a good product and keeps our dog safely in the yard. "Needs a larger coverage area"
"Works well. Keeps dogs on my property. Very easy to set up." Works well. Keeps dogs on my property. Very easy to set up. Couple of drawbacks. It can be challenging to find the right location for the main unit. The field it creates is a perfect circle, so I ended up having to put the unit in my kitchen to create the desired perimeter. Also the battery life for the collar is pretty short (less than 90 days). Probably the biggest issue I had was that both collars had to be replaced within the first year. Since the manufacturer replaced them both free of charge as it was still within the one year warranty, it wasn't that big of a deal. From information that I've found on the internet, it's pretty common to have to replace the collar every year. All of that said, it does work as advertised. "I've had the system for years." I've had the system for years. I recently added a second transmitter to allow for more space for the dogs. Once the dogs are trained to stay in the safe zone, you can set the collar so it just peeps, and they will not challenge the barrier. "Set up quick and easy." Set up quick and easy. Dogs adapted very quickly, and we are very pleased. "Pros: Works great. Cons: Battery replacement in the collar." Pros: Works great. Cons: Battery replacement in the collar. "Works great and does the job." Works great and does the job. "We followed the manufacturer's recommendations, and the largest metal object is the garage door near the unit, but it's not the best training tool for a new pet b/c the boundaries can change surprisingly." We have an average size home and yard, and the unit is placed in the garage. Her collar can alert her at random places in the yard. We followed the manufacturer's recommendations, and the largest metal object is the garage door near the unit, but it's not the best training tool for a new pet b/c the boundaries can change surprisingly. "It keeps my dog in the yard when the battery is fresh"
It keeps my dog in the yard when the battery is fresh, but he is smart and tests the limits. When the battery dies, he bolts. Able to keep him in the yard by replacing the battery every couple of months. "I was sent a defective transmitter. Waiting for new unit from Petsafe." I was sent a defective transmitter. Waiting for new unit from Petsafe. "This product was very easy to set up the perimeter. The negatives are with the collars." This product was very easy to set up the perimeter. The negatives are with the collars. I have had to replace both collars, and they are pretty costly. I have had 4 collars so far, and all of them have lost the beeping function. Therefore, my dogs do not get the warning tones prior to being shocked if they get too close to the boundary. Disappointed. The signal seemed intermittent at times. He broke through the line twice and didn't seem to be phased at all. Was hoping it would work better. The battery was dead when we received it. The whole collar was replaced, then we didn't try again; the weather was too bad. Then the collar would shock her if she came anywhere near a metal doorknob, door jam, or her crate no matter where we moved the base in the home. So it's now back in the box, just sitting. I threw that thing out over a year ago. It was junk. FREE SHIPPING / 100% Satisfaction guaranteed! 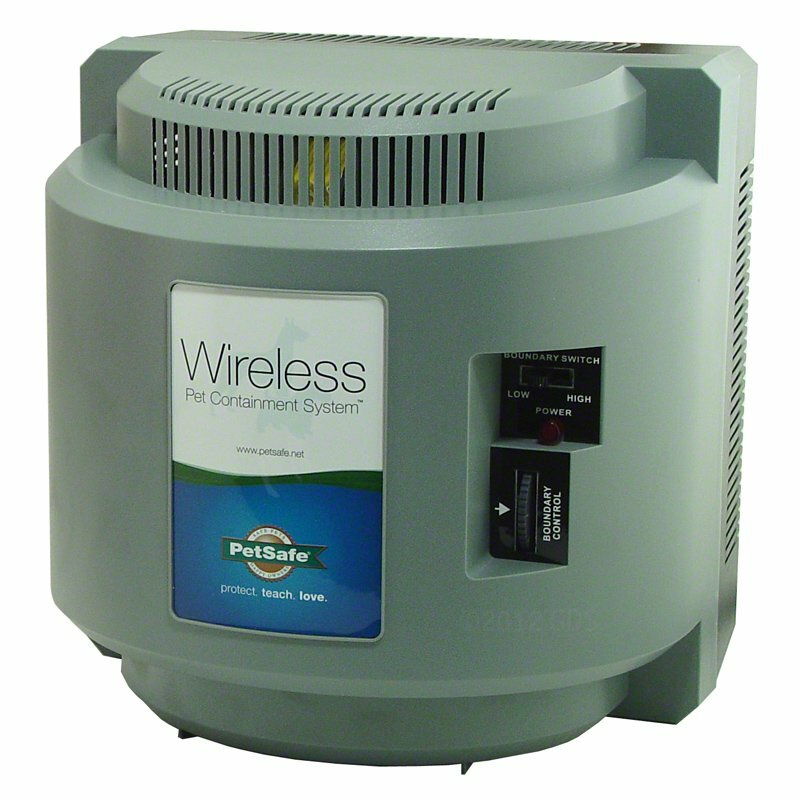 Offering safety and portability, the Wireless Instant Fence PIF 300 from PetSafe gives you instant installation. If you can plug in a cord, you can install Instant Fence: no unattractive poles to set up and no wires to bury. Instant Fence uses a constant radio signal to create a "stay zone". When your pet leaves the area, he receives a mild correction until he returns to the containment area or until approximately 35 seconds have passed. 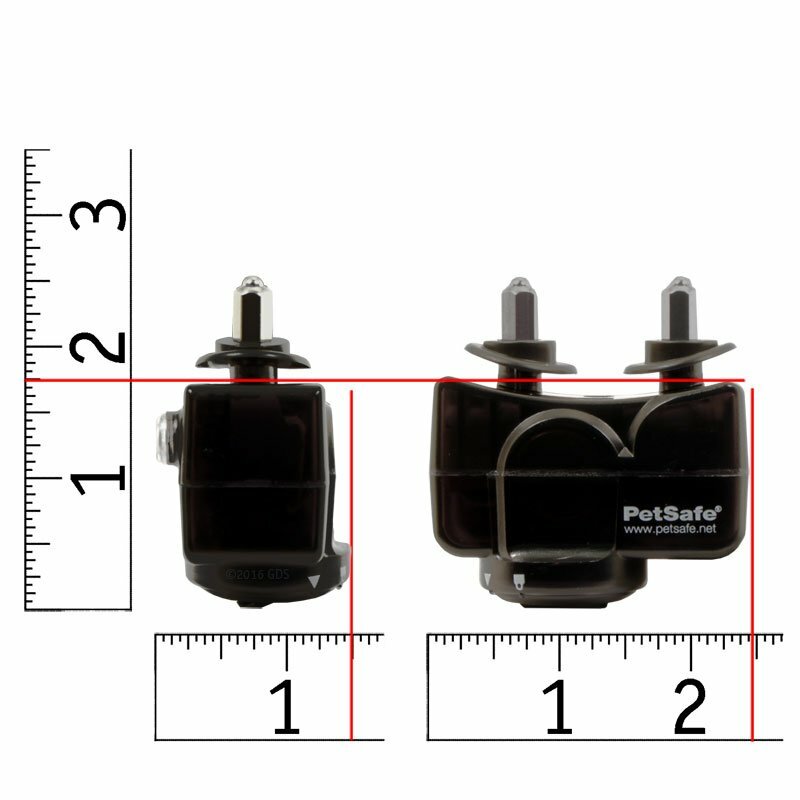 Since Petsafe Instant Fence is completely portable, you can take it and your pet wherever you go. So your pet is safe, and your mind is at ease. One year / Limited Lifetime Manufacturer's Warranty Click here for Extra Receiver Collars, Transmitters, and Batteries. Since Instant Fence is completely portable, you can take it and your pet wherever you go. So your pet is safe, and your mind is at ease. Setting up your Instant Fence takes only minutes. The transmitter plugs into any standard 110 volt outlet. 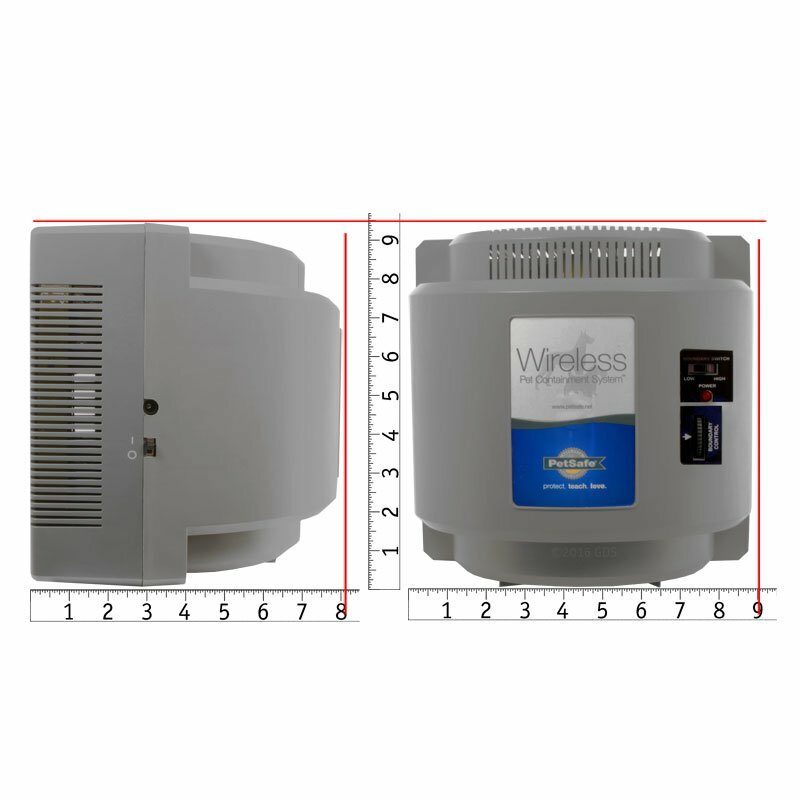 Since the signal can transmit reliably through walls or other household obstructions, it can be placed in any convenient and discreet location in your house, typically a garage or closet. A small dial allows you to adjust the signal area. Training is simple and easy. Once you have adjusted the signal to the perimeter you want, mark the boundary by placing small training flags at the edge of the signal area. Then, using a leash and holding the collar, walk your pet around the boundary, pointing and shaking the flags, saying "NO" and letting your pet hear the beeping of the collar. Next, let your pet wear the collar and walk the boundary again. Let it, on its own, venture into the signal area and get the correction. Quickly pull it back into its yard and praise and play with it, again pointing to the flags and saying "NO". Repeat this process each day for a few weeks and your dog will quickly learn its new boundaries. After thirty days, you can gradually remove the flags.